I invited several top leaders, authors, and bloggers to share their wisdom with Leadership Freak readers. 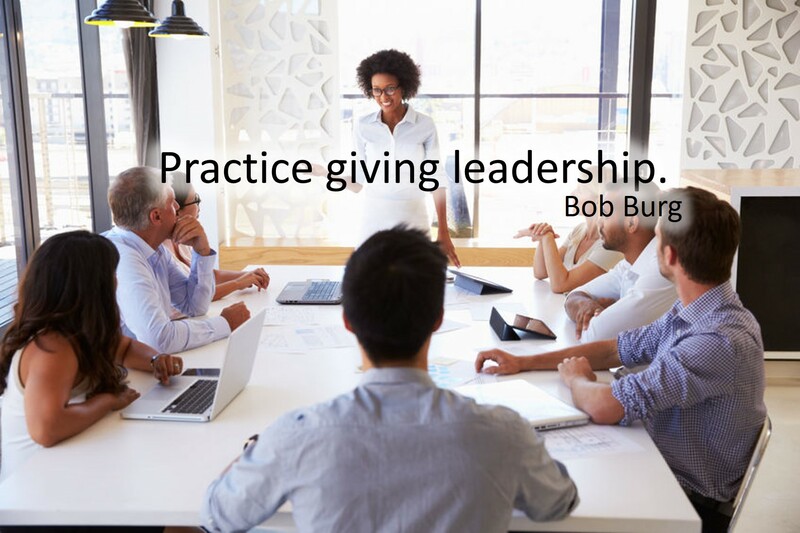 Thanks to Bob Burg for sharing this insightful post filled with advice for future leaders. I’m often asked for advice for future leaders. While my overall advice would be to make learning a continuing and ongoing practice throughout life, here are three ideas to begin with. So, if you are casting a vision to which you want others to commit, you must first commit to them; not as cogs on the way to you accomplishing your goals, but to helping them to accomplish their goals. Align your vision with their wants, needs, desires, and values. Create an environment for them to grow. #2. Realize that earning trust will always be your most valuable personal asset. And, you do that by the way you commit to others genuinely and authentically. One way to accomplish this is by keeping your word, building others at every opportunity, standing for what is right, and always acting congruently with those values. #3. Embrace the fact that leadership is never about the technology — it’s always about the people. As Geoff Colvin discussed in his terrific book, Humans Are Underrated, the more advanced technology gets and the more that machines can do that humans cannot, the more important elements such as empathy, team-building, collaboration, and interpersonal relationships (you know, those “human things”) will become. What are YOUR big three (or two, or even just one)? What advice would you give to future leaders in order to help ease their path? Bob Burg is coauthor (with John David Mann) of the international bestseller The Go-Giver and The Go-Giver Leader. Visit www.thegogiver.com for information on their books (as well as to download a free chapter and excerpt), For The Go-Giver Podcast visit (www.thegogiver.com/podcast). Thank you, Tim. Very grateful! My top 3 recommendations for future leaders would be to treat people fairly, encourage others personal growth, and be a good listener! I would encourage leaders to build others, empathize and try to understand others, and show integrity and honesty in your actions. 1. Relationships matter! Build bridges not walls. 2. Clearly communicate the vision/goals and create a path so all can succeed or contribute to the success. 3. Listen closely to what is being said and not said, and respond accordingly to create buy-in and ensure all are on the same page. Very well-said, Imelda. Thank you! Participate – it is the cure for isolation, alienation and character building. Never underestimate the power of silence and stillness – in it you will learn not to run from what you can’t see, but to wait and listen for new information. This too is part of the process. Feelings can drown you or shape you (Walt Disney) – learn to appreciate and live with yours and to extend tolerance to others feelings for they also are on their own journey and by acknowledging and respecting our differences we can lessen dependency by realising our interdependence on the whole in order to grow confidence and facilitate opportunities. Paul, excellent suggestions! Thank you! Read also the other Simon Sinek’s book “Start with Why”. Great stuff! And my favorite quote “Nobody ever washes a rental car.” — you gotta give them a sense of ownership involvement for them to take any interest in things. Thank you, Glen. I appreciate your kind feedback. And, great suggestion! Brilliant (as always) thank you. For me “Listen to understand, not respond” is the gateway to continuous learning and an ever ending source of surprise. Agree with you 100 percent, Dan!